At Earthy Bliss it has become my mission to provide parents with superior quality, divine comfort, and a flattering style for the wearer of all shapes and sizes! My designs were carefully thought out with you in mind! The ultimate mei tai, with all the bells and whistles of the Exclusive “Custom Carrier” that until now, has been unattainable by the majority of baby wearers. Padded wrap straps that actually cup your shoulder to prevent them from riding up on your neck & evenly distribute the weight over the ball of your shoulder, eliminating pressure points on the neck & shoulder area. Legs out padding for the comfort of slightly bigger babies and a uniquely padded waist with the Infinity Diamond Stitching. The 1st and last baby carrier you will ever need! This carrier is unique in that fits newborns from 7 lbs and up to 45 lbs Pre-schoolers comfortably. Original *Patent Pending* Hybrid Sling Waist provides a wide waist strap that is secured close to the body with a small set of rings that keep the fabric spread nice and wide. It reduces pressure points on the lower back. There is no lower back knot, distributing the weight and the increasing your comfort . Reducing the appearance of an accentuated “muffin top” the wide strap creates a sleek and flattering appearance for wearers of all shapes and sizes. One simple roll of the waist and you can reduce the height of the body by 8”, bringing the narrowest part of the hourglass shaped body to the point that a smaller baby would be legs out. This carrier has the same comfort in a back carry as a front carry. Complete with sleep hood to support a sleeping baby, shade from the sun or that can be used as a nursing cover. 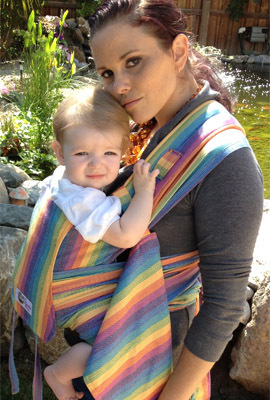 This carrier offers the comfort of a woven wrap, with the ease of a Mei Tai.